"a confident, breezy, joyous album"
“Windblown” is the first CD of the reformed Jamie Smith’s Mabon and allows them to lay out their stall and their new stance in studio recorded form. The original Mabon had some personnel changes just under two years ago and re-branded themselves as Jamie Smith’s Mabon. This came however not long after releasing their highly acclaimed live album “Live at the Grand Pavilion”, so they’ve spent the last year and a half touring with the new name and line-up, yet only having the old album to sell (good album though!). "step into a brave new world…"
As the name suggests it’s a wonderfully autumnal album, released to coincide with the changing of the year, and just before the samhain (when the gates to the otherworld are left open). Mabon itself means autumn equinox. Winter might be on its way, but the harvest is in and it’s the season of plenty. The artwork (shot in the cellars of Bristol’s Colston Hall) is all fallen leaves, golds, greens, browns and hints of chocolatey-red. Musically, it’s… well, it’s sort of more of the same but different. 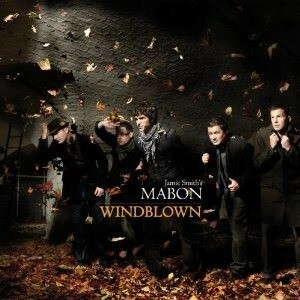 If you like Mabon (and I do) then you can expect a confident, breezy (sorry for the pun!) joyous album with JSM’s trademark interceltic folk sound played out by Jamie’s accordion, Oliver Wilson-Dickson’s fiddle, Adam Rhodes’s bouzouki, Matt Downer’s bass and Iolo Whelan’s drums and augmented by guests Tomás Callister on fiddle, Calum Stewart on flute, Dylan Fowler on acoustic guitar and lap steel and Will Lang on bodhran. The biggest change from previous albums is the inclusion of four vocal tracks into what was previously always an instrumental band. Now, I’ve personally got no problems with instrumental music at all (in fact I’m frequently at odds with singer-songwriter friends for whom “the song” is everything), but it seems to be an integral part of the new direction for JSM. The four songs on the album are “Lady of the Woods”, “Summer’s Lament”, “Yes, We Sing Now” and the Welsh language “Caru Pum Merch” (Loving Five Girls). Jamie handles the vocals well and there’s some sympathetic vocal support and harmonies from Oli, Adam, Matt and Iolo on the Tolkienesque “Lady of the Woods”. “Summer’s Lament” has a hint of Country music to it (which gives it a relaxed, comforting feel). I’d always assumed that the rather obviously titled “Yes We Sing Now” was a tongue-in-cheek riposte to doubters of the new order, however according to the liner notes it’s a positive song about finding happiness through the forgotten art of contentment. I particularly like “Caru Pum Merch” , a tender song about loving the same woman through the different stages of her life (Loving Five Girls - geddit? ); the latter is also unusual in having the lyrics written by drummer Iolo Whelan; so all those who think that the drummer’s job is just to keep the beat (or worse still act as a spirit level for the stage crew - the old joke about how do you tell when the stage is level? The drummer dribbles equally from both sides of his mouth…) had better think again. If the English translation of the lyrics are anything to go by then we have a poet in the house my friends! "there’s plenty of what has made Mabon so successful"
But if lyrics don’t move you then rest assured there’s plenty of what has made Mabon so successful. There’s uptempo rockers from the live set including the exuberant “Whiskey Burp Reels” and the intense “The Gordano Ranter”. There’s also the jolly “Huzzah!” (and here’s me thinking I was the only person still to use that expression!) which is a medley of “The Banana Skin Slip, The Discombobulator and Huzzah! “Tunnag’s Tunes” is another medley, this time dedicated to Jamie’s late cat, Tunnag (including Mr Nibbles Cheats Death and Feed The Worm!). “Gareth and Aoife’s” is a beautiful little waltz dedicated to a couple of friends who married recently. And finally, “The Joy of Lowenna” (a medley which includes a Galician style muiñera - written on the Llyn Peninsula entitled A Costa De Criccieth) is dedicated to the newest addition to the Mabon family, Jamie’s baby daughter Lowenna (Cornish for ‘joy’). "JSM have set out their stall, so step up ... Well worth buying." So there you go. JSM have set out their stall, so step up and see what they’re selling. Well worth buying. “Windblown” is released on 29th October 2012 on the “Easy On The Records” label and is available via their website (www.jamiesmithsmabon.com) or independent records shops, HMV, Amazon or iTunes, etc.